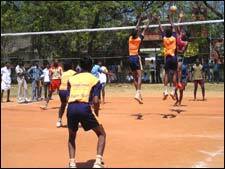 Whittaker Cup Inter-Church Sports Festival is an event that took place between 01-Oct-2008 and 04-Oct-2008 in Hyderabad. Wesley Church (Church of South India - Diocese of Medak) is organizing the Whittaker Cup Inter-Church Sports Festival. The event is held annually and this is the 10th tournament. For the singing competitions, participants must bring their own musical instruments. Only Christians are allowed to participate in the competitions and only one team from each church is allowed to participate (For the quiz competitions, a team consists of 2 members). Names of team members are to be submitted on the letter-heads of their respective churches, signed by the Presbyter-in-charge. Please contact Wesley Church at 2475-1299 for further details. Be the first to comment on Whittaker Cup Inter-Church Sports Festival! Just use the simple form below. fullhyd.com has 700,000+ monthly visits. Tell Hyderabad what you feel about Whittaker Cup Inter-Church Sports Festival!